Rent voila! Studio | Corporate Events | Wedding Locations, Event Spaces and Party Venues. Created in 2008 by Katrien van der Schueren, voila! Creative Studio specializes in events and custom design. We offer a creative atmosphere in an eclectically versatile space that can be arranged to fit your needs. Located in the heart of the Hollywood’s design district, voila! Creative Studio is a 6,000 sq. ft. arthouse that embodies a variety of unique spaces. Originally specializing in custom art fabrication and museum-quality framing, the business has grown to encompass customize furniture design and production, interior & set design, and event production. In 2013 voila! completed the interior design and decor of The Lyric Theatre, a neighboring music & comedy venue. voila! began hosting live performances in the theatre from artists such as Allen Toussaint, Arno, and Jean McClain. Since its redesign, the uniquely repurposed black-box theatre has continued to house many entertainment acts such as Corinne Bailey Rae, Sarah Silverman, Deryck Whibley of Sum 41, Louis C.K., Anderson .Paak, and countless others. voila! itself has hosted artists such as U2, Camila Cabello, G-Eazy, Moses Sumney, Moonchild, Nick Hakim, and the Mudbug Brass Band within its walls, and has provided set design for Willow Smith, KING, and Queens of the New Age, to name a few. With this inspiration in mind, voila! Creative Studio has conceived its newest location with the capability to cross-pollinate the stimulation of all of your senses. From the chair you sit in, to the sounds you hear, to the delicacies you taste, to the ambiances and environments surrounding you, voila! takes every part of your experience into personalized consideration. The artistic space celebrates and embraces life’s passions, whether it be design, art, music, dance, film, or fine cuisine. Between the projection, sound, and lighting systems, to the kitchen, to the treehouse lounge, voila! offers the amenities needed for an impeccable event experience. By combining its collection of eclectic furniture and decor with its in-house art and design team, voila! can efficiently transform their venue to adapt to the needs of your event, and turn your ideas and imagination into an unforgettable affair. 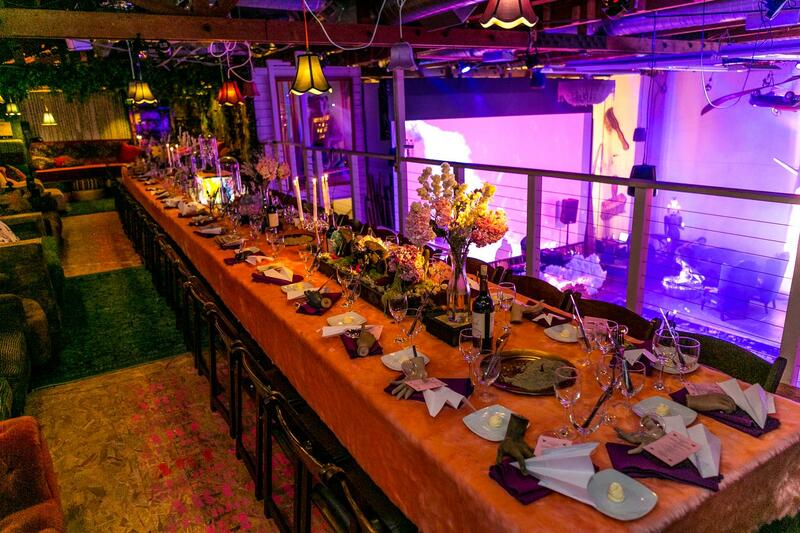 voila!’s event planning and production team is always ready to put together your next one-of-a-kind event; however, event planners and outside vendors are also more than welcome to execute their own vision. Whether you’re looking for a venue to hold your album release party, film shoot, after party, reception, dinner celebration, holiday party, or networking mixer, voila! is ready to host your next event that will have everyone talking. •	Seated & standing configurations up to 250 people.